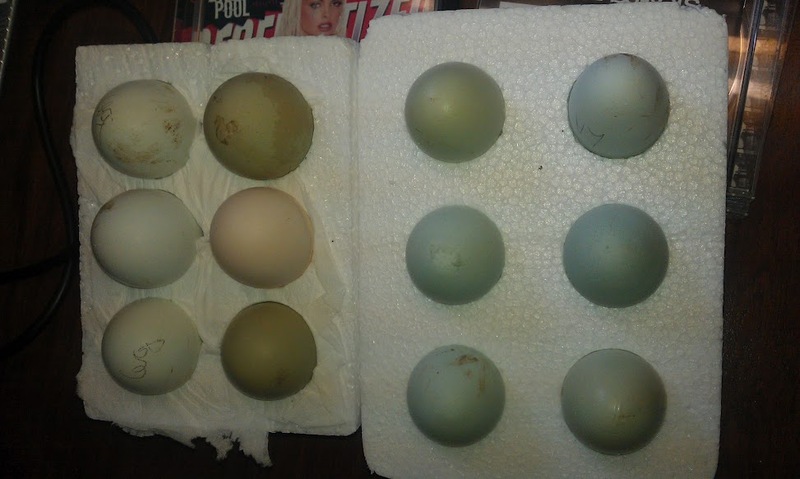 Just ordered six Cotswold Legbar eggs and six Arucanas. Both of these breeds lay different colour eggs. One blue, one pastel shades, turquoise, peach, pink and olive! Should add some colour to the egg run. Spent a bit of time in a flap today. Whilst collecting eggs from the nest box, I noticed blood on one egg, and blood on one side of the nest box, along with a cracked egg shell. Initially I thought something quite nasty was going on with one of the birds. Though watching them in the run they all looked perky. Then I spotted blood on Hermione’s beak, and that Harry had blood all over her comb. Hermione and Harry are from our first hatch, and will be three this year. Harry has a tendency to go broody when it warms up, which means she hogs the nest box, gets twitchy and irritating. Hermione doesn’t stand for that kind of behavior. And gets cross about the nest box. We will have to keep an eye on her and try and discourage her broody tendencies.